This is kind of like travelling to New Zealand. You lose a day entirely on your way there, then you get to live through two of the same date on the way back. So we skipped Day 28 and we’ll have two of Day 29. [Ed. OK, after a little confusion, I put the first Day 29 under May 28 and called it Day 28.] This is supposed to be easy for me to keep track of, since we left home on May 1st, and that makes the date the same as the day. But I have to tell you, things are starting to run together out here on the road! As to the picture today, I know we’re still in Indiana, but with a sign like this, how far away could we be? 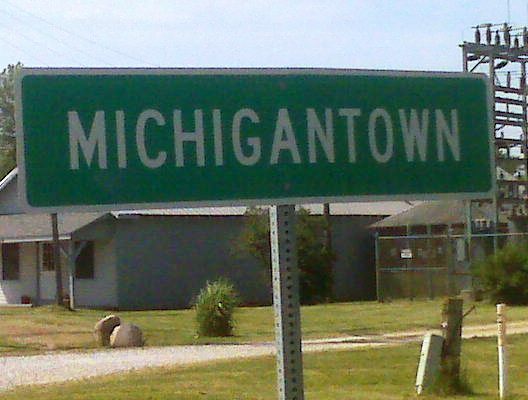 We leave town tomorrow by way of Michigan Road, further proof that we’re headed the right way. Each day when we arrive in our destination town, it is a small victory and a feeling that is hard to describe. Sometimes we’re exhausted, sometimes not, but we’re always glad to be there. We’re ready to get off the bikes, we’re grateful to arrive safely, and not least of all, we’re a little amazed that we have found the way here and delivered ourselves under our own power. Most nights we find ourselves toasting another day and our arrival in somewhere-ville-burg-dale. Today was mostly uneventful, just slogging up the highway with large, prosperous farms on either side. Corn fields abound, as do hog operations (“the other white meat”, the signs remind us!). Pigs really smell bad. We benefitted greatly from the fact that it was a Saturday of a holiday weekend. Very light traffic and almost no trucks (YAY!). The wind was out of the east all day, so we had a crosswind, and occasionally felt a push. It could have been a lot worse. The second picture is just a little building at the roadside that was too pretty to miss. I wish I could have caught the nice blue- water pond, with geese, next to it. I couldn’t catch the angle without really venturing onto the property. Once again, we found the off-brand, cheap motel in town. We’re staying at the Manor Motel, breaking our record at 40 dollars. It is fine, although the TV is possessed. 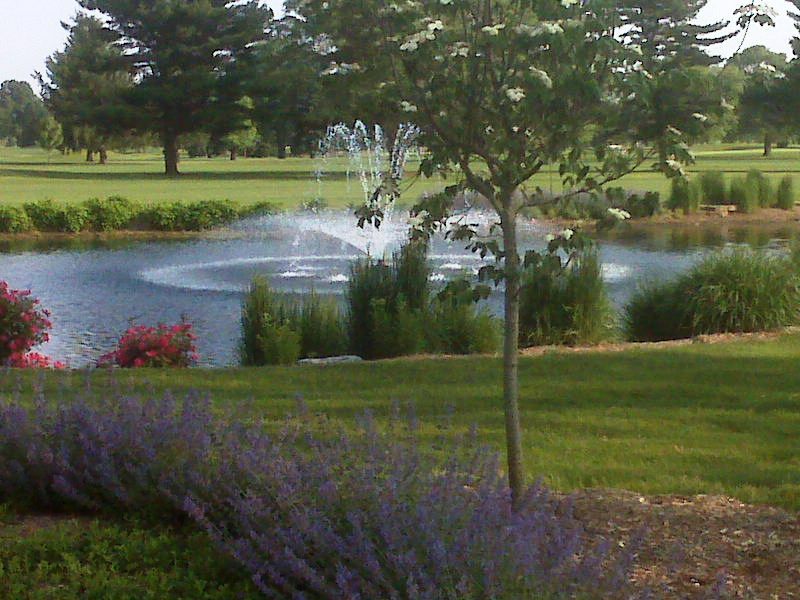 We are having dinner on the deck of the restaurant, overlooking the golf course and a pond, similar to the one in the picture. We shared an excellent steak dinner. 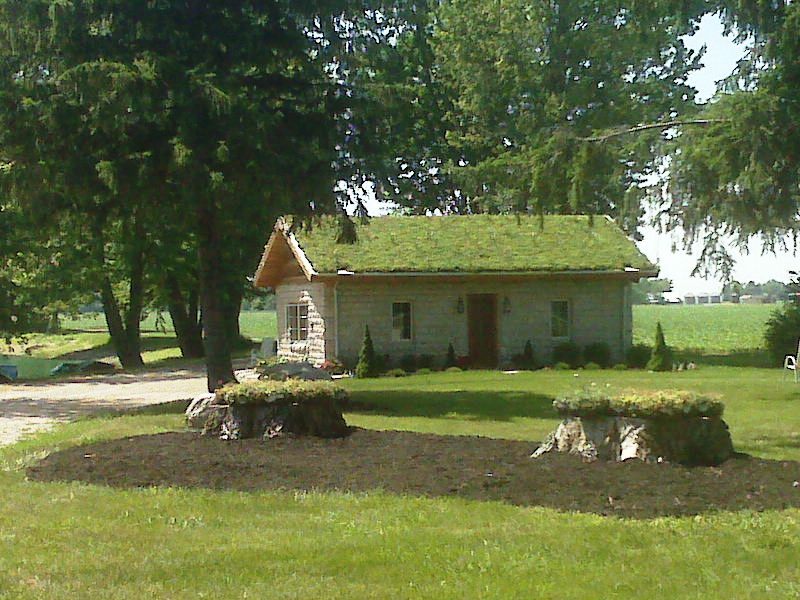 It is a wonderful place to relax and unwind after a day on the road. The only problem is that we’re not sure where we’re going tomorrow, a first on this trip. I am still determined to have us off the road by noon or so, in order to avoid the Memorial Day crazy people. We experienced some of that today, forcing us off our road onto smaller ones until we found sanctuary here. We think we’re headed for a B and B in New Carlisle, only 30 miles away, but I’ll let you know. It will keep us from reaching the Michigan border tomorrow, which pains Tom, but it can’t be helped. Unfortunately, the options between here and South Haven, Michigan, our next goal, are very limited. We are trying to steer well clear of South Bend. Our ride today was wonderful for the first 36 miles, very low traffic and not completely flat, but undulating just enough to change things up. We ate lunch at a root beer stand/drive-in in Culver, Indiana, on Lake Maxinkuckee (!!). It was a happening place. The entire town (small) was hopping with lake visitors, and reminded us a lot of some of our favorite spots along Lake Michigan and our part of up north Michigan. I would bet that this is one of the hottest, sunniest Memorial Day weekends that they have ever seen in northern Indiana. The nasty, aggressive drivers showed up on our previously quiet road after lunch, and that’s when we decamped to other routes. Fortunately everything we found was paved, and we’re hopeful for the same tomorrow. As an aside, we seem to have outrun Tom’s allergens. He’s ridden two full days now without having to wear a mask. He hasn’t complained about it, but the mask is very hot, and it’s a great relief not to wear it. His shoulder is holding, doing well. Yeah, I know I said we weren’t crossing into Michigan today. I also said we would be off the road by noon. We changed plans three times regarding our day’s destination, and things kept shifting all day, but it was a good day, and everything worked out. We started the day headed for New Carlisle, Indiana, and a bed and breakfast there, as it was the only place we could find to stay that was about thirty miles in the right direction. We had a killer tailwind and nice back roads. By noon it was clear that we could go on to our earlier “scheduled” destination of a campground in Buchanan, Michigan, which was closer than we thought. We called and made a reservation there and changed our route accordingly. We began to hear rumbling to the southwest, and for the next hour or so a dark sky followed us to our left rear. It got darker and more ominous looking, and I could see an occasional bolt of lightning, still well to our left. The sky above us was benign. Then about two miles out of Buchanan, we needed to turn left and head right into it. That’s when we got a good look at it, and it really got our attention. 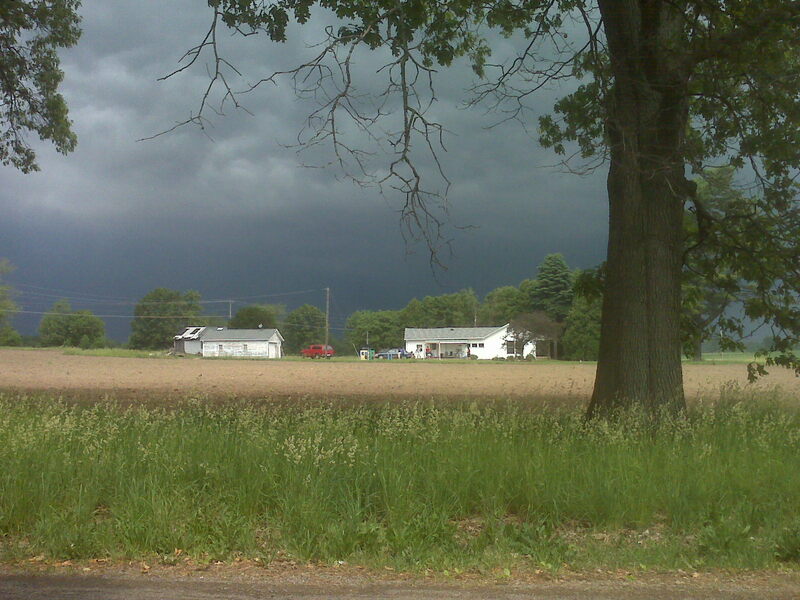 It was quite menacing – I kind of felt like I was in a scene out of the movie “Twister”. Even Tom said we couldn’t beat it into town. Fortunately there was a community center at that corner, with both a covered picnic pavilion and a building with a covered entryway protected on two sides. We took shelter there, and waited for it to hit, but it moved away slowly, dissipating, re-forming, and dissipating again. I haven’t heard anything about funnel clouds etc. on the news tonight, but this was impressive. I’m including a picture I took of the sky, but I don’t think it does it justice. We sat for about 30 minutes, then rode into Buchanan, thinking we’d find a laundromat and have lunch. Laundromat closed, but lunch was good and I made the sign so the waitress could take our picture. We had passed the state line on such a back road that there was no sign-we took pictures of each other when the GPS told us we were there. We beat the rain into lunch but it rained steadily all through lunch and looked like it would continue. The idea of camping in the rain was not appealing. Our camping equipment is very basic, including the tent fly, which we haven’t used but which is a plastic tablecloth from the dollar store. The idea of riding into Niles, 6 miles away, had seemed unacceptable earlier, but was looking better and better. So we made phone calls, checked locations on Google maps, and off we went to Niles in the rain. We let the GPS lead us, as we did most of the day, since we were off of my planned maps. We have a good friend who is from Niles (the center of the universe to those in the know) and still has his mother’s house here. Months ago he offered it to us to stay overnight with our sleeping bags, and that has been a possibility for us all along. Then we really thought we would be elsewhere, so by the time we knew we’d be in Niles tonight, it was too late to arrange to get the key. The odd thing is that the GPS took us right by his corner, and I recognized the location and the house. So we found ourselves standing on Oak Street in Niles, Michigan, taking pictures of Rich’s house, in the rain. It is a very small world. As a further coincidence, the no-name motel where we are staying tonight used to be the Holiday Inn, where he was a night auditor. Tomorrow we are headed to South Haven, Michigan, on Lake Michigan, and possibly beyond. It will partly depend on the roads and the winds. We are trying to work it so that we have an off day in Holland, one of our favorite spots, and we will reach there Wednesday no matter where we go tomorrow. We will be in familiar territory once we reach South Haven, as we have bicycled the entire Lake Michigan shoreline from there to Torch Lake. We are very much looking forward to this last week of riding. At the risk of being premature, we can’t help feeling a little like “phew, we made it!”. Today has been a glorious day. The sky, once the fog lifted, was a perfect, cloudless blue. It was warm in the sun, cool in the shade as is so typical of Michigan days. We had a southwest wind, so a gentle push all day. I had no idea how emotional it would be for me when we first saw the water. Lake Michigan is so vast, and so beautiful. It is very calm today and very blue – the picture doesn’t do it justice, but I had to take one as soon as I saw it. Seeing it had a bigger impact on me than any of the state lines, and the emotion kind of blind sided me. It suddenly hit me what Tom and I have done, making our way here. I have to say it didn’t have the same effect on Tom. He is much more focused on practicalities. The lake remained on our side, a huge presence, for the rest of the day, as it will be for the rest of the trip. We live immediately off of Lake Michigan at Torch Lake, so that presence is a constant in our lives. 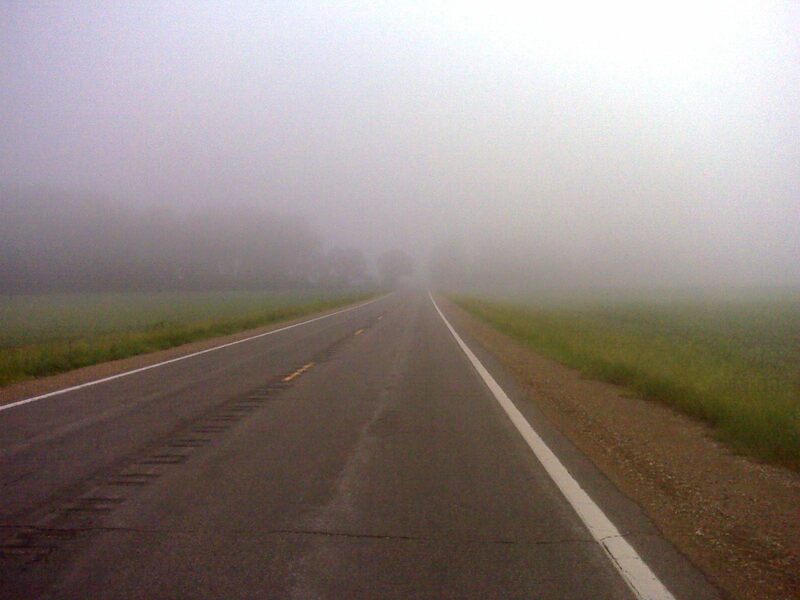 We started the day out of Niles in fog. We had our red blinking taillights, traffic was light, and we were carefully watching our mirrors, so we didn’t feel we were in danger. It was a very cool feeling, still and mysterious, and we enjoyed it. The sun burned through before long. It was an easy, easy ride today, and we arrived in South Haven at 1:00. Suddenly we were in our first pretty lakeside Michigan town, with cottages, gift shops, restaurants, fudge and ice cream shops… We will see this repeated all the way up the coastline, where these small summer tourist towns are dotted like gems. We were in South Haven overnight a year and a half ago on a four day bicycle trip,and we liked it, but it was October then, rainy and cool. It felt so different today, in the beautiful sunshine,with all of the trees and flowers at their spring best. The whole town had gotten spruced up for the Memorial Day weekend, and looked great. We had a great lunch on Main Street while we plotted our aternoon. We decided to ride the next 20 miles into Saugatuck, where we have also stayed overnight. We arrived in Saugatuck around 5:00, with the same feeling we had in South Haven – prettier, greener, more prosperous, just sunny and more welcoming! We immediately found an outdoor bar on the river, kind of Michigan’s version of a tiki bar. We enjoyed two more hours of warm sunshine and the sense of well-being from riding before dragging ourselves off to our motel to get cleaned up for a nice dinner at a restarant a couple of blocks away. 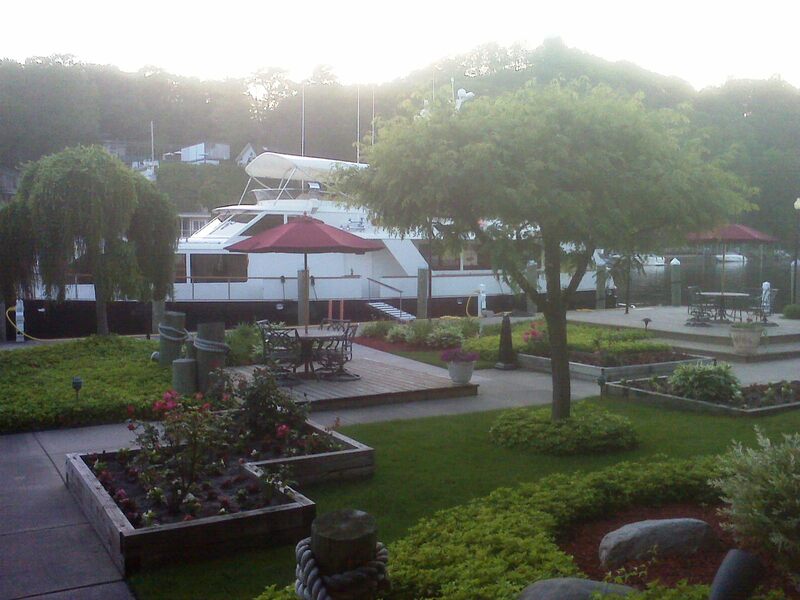 Saugatuck is a great little town, known for its arts community and many galleries. We are staying at the Ship n’ Shore Motel-Boatel, situated in town,on the Kalamazoo River. In addition to typical motel guests, they cater to boaters who rent dock space from them, and then have access to their facilities. This is not a fancy place, and it is a bit run down and dated, but we like it. It was very affordable, not actually much more than we paid for the no-name motel in Bloomfield. The location ON the river is unique, and they have beautiful landscaping as well as a nice pool and hot tub. I included a third picture, which is pretty much the view from our room. This “boat” is 92 feet long, and a beauty. The captain and one crew member are on her, and will be taking her to Chicago in the next few days. She will go to the Bahamas next winter. As is so often the case with yachts like this, the owner is not here, but will fly to meet the boat when it suits him. I’m actually finishing this up on Wednesday morning. The weather has turned again, as predicted, and we had heavy thunderstorms a couple of hours ago. It has settled into a steady drizzle. We plan only to ride the 13 miles or so into Holland today, and will consider it an “off day”. We are lazing around here and will take our time leaving. We waited out the rain, ate lunch in Saugatuck, and mounted up for the 14.82 mile ride into Holland. We had a cross wind/tail wind again, so we were here before we knew it. We first visited Velo City Cycles, a favorite bicycle shop of ours, then strolled the downtown streets before settling at the Holland Brewing Company, another favorite. We are staying at the Haworth Inn and Conference center of Hope College, which is only one block off of the main downtown street. The people here couldn’t be nicer, and it’s such a great alternative to the chain motels out on the strip. We have been here once on our bikes and several times by car, as it is only about a 45 minute drive from Grand Valley State University, where our son goes to school. Unfortunately, he is not there, having flown home to Peachtree City last Thursday from the lake. It took him about five hours to get there, the same trip we’re doing in five and a half weeks. He will drive the family van up for us, picking up the dogs and cat from Lindsey in Knoxville on the way. But I digress, imagine that! Holland is a town with very strong Dutch roots, as evidenced by the names on mailboxes and business signs here. It is home to the annual Tulip Festival in April. Our veterinarian Rip (hey, Rip and all the staff at Animal Medical Clinic!) told us a funny story about the tulip festival. They visited one year as a family, left for Grand Rapids for a couple of days and then returned here. Meantime there had been a big wind storm, and the tulips had all been torn off. He said they still refer to it as the “stem festival”. We had dinner at an Irish pub with the most extensive authentic Irish menu I’ve seen. We’re back in our room, preparing for an early night and a full day tomorrow. We’re headed for Whitehall, Michigan, by way of Grand Haven and Muskegon. Today was a real mixed bag of riding. We left Holland on familiar roads, having done the ride to Grand Haven previously, both northbound and southbound. That 20 miles was easy and scenic, with an occasional glimpse of Lake Michigan down side roads to our left. We took a morning break in Grand Haven and devised our attack strategy for the middle third of the day’s ride, which was much more complicated. There is water everywhere here, rivers and lakes, many of which connect to Lake Michigan. You either have to go around them or over a bridge. Today’s hurdle was the huge drawbridge over the Grand River, very busy, with lots of traffic. We had done it southbound, and knew there was a path system that we could use, but we weren’t sure how to access it from the south. We need not have worried – we turned out onto the main road and the path appeared before us as if by magic. It delivered us safely to the other side, and we used a combination of prepared maps and GPS to move on from there. 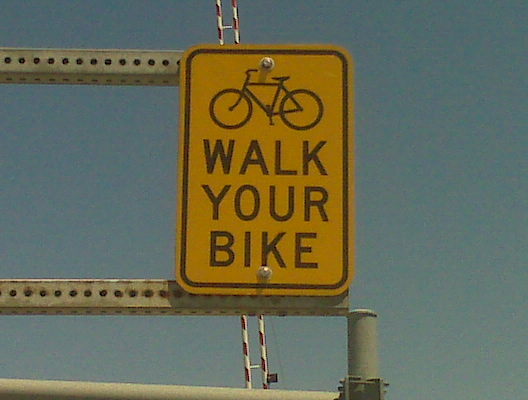 The picture of the sign is from the bridge. I got a kick out of it for some reason. We walked, much to Tom’s disgust, because I have difficulty breaking rules. We saw several other people riding across. The rest of the route was new to us and required ongoing re-invention. The route we had taken previously stayed close to the big lake and was more scenic, but required a lot of east-west travel to get around Lake Muskegon and White Lake, here in Whitehall. We opted to head directly for the eastern end of Lake Muskegon, and from there to the eastern tip of White Lake. By the time I got to this section of route planning at home, I was tired of the whole process and running out of time. I let Google Maps plan the route for me, using their “bicycling” option, which is a fairly new feature on their website. The city of Muskegon, Michigan is an industrial town, not a pretty lakeshore town. Not that it doesn’t have its nice spots, but our job was to navigate through it to the other side, staying, as much as possible, off of the busiest roads (although at times those have the widest shoulders, sooo…) Anyway, the day was full of decisions and problem solving. We were on some terrible pavement with huge potholes for quite a while. We have a personal theory that it is the goal of the GPS genie to bring us into any town by way of the most rundown, depressing neighborhoods. We did wend our way around until we got onto the path system that skirts the east end of the lake, allowing us to avoid some really complicated roads. We met a nice older couple on bicycles (older like us) on the path, and talked with them for a while about where we were going and the ways to get there. Obviously that didn’t do much good, because 6 or 7 miles later we found ourselves on unpaved road again, for almost two miles. It must be a law, I don’t know. We walked and rode that section, then finally just took the busy but shoulder-endowed Whitehall Road into town. We are staying at our first B and B of the trip, the very nice White Swan Inn. We came into town without a reservation, found that this Inn was in the area we wanted, and called. Poor people, we showed up at their door about four minute later. We were so late arriving we went to dinner without changing or showering, and sat outside at the Harbor View Grille (which does in fact have a very nice view of the harbor, but the glare from the sun prevented a good picture). 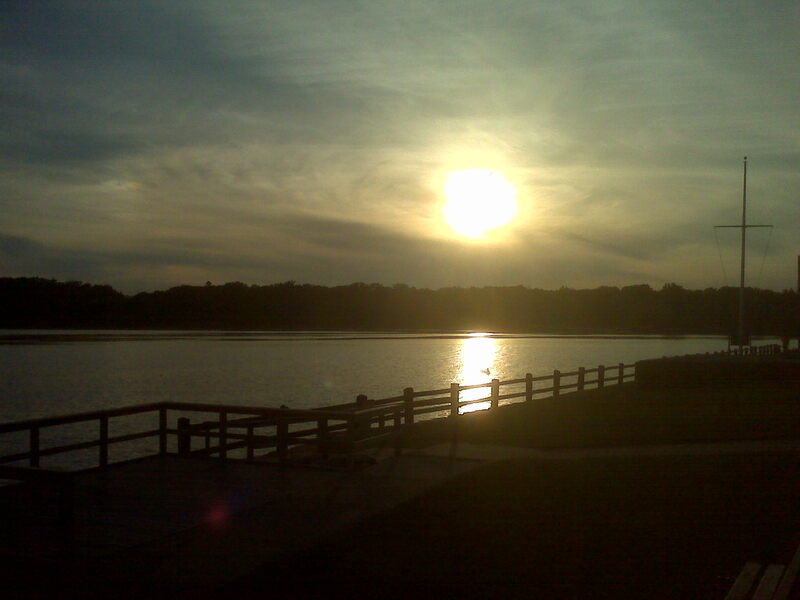 The picture I did get is the almost setting sun over White Lake. Too cool to stay out and wait for the full show. Tomorrow the first 20 miles or so will be on the Hart-Montague Trail, a converted rail-trail. We are still in the flat part of Michigan, but will start seeing hills soon. 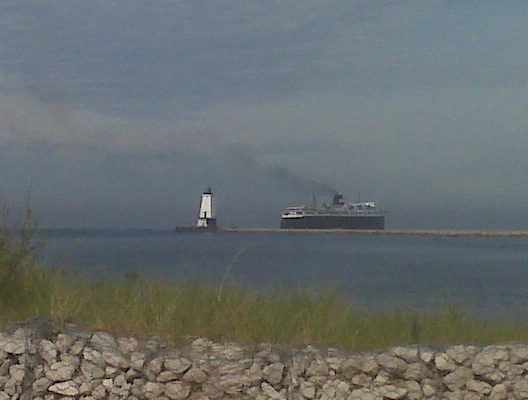 Tomorrow night’s goal is Ludington, Michigan, departure point of the huge ferry to Wisconsin. We started our day on the 22 mile stretch of the Hart-Montague Trail, a converted rail-trail. Being an old railroad bed, it was fairly flat and straight, and of course we didn’t have to worry about traffic. But the pavement was not in great condition, and it was a bumpy ride. The posted sign told us that “If you have time to complain, you have time to help!”, so we are not complaining. We did opt to leave the trail and take a smooth road with a shoulder at about 15 miles. The railbed made a wide swing to the west and back, it was raining, and the road went straight, so it was not a difficult decision. We ate lunch at 28 miles in Pentwater, yet another wonderful lakeshore town. I remembered a nice laundromat I’d spotted on our way south last August, so we put a couple loads in, which was just about everything but the clothes on our back, and went to luinch. I’ve read stories about cyclists in laundromats wearing only garbage bags so they could wash everything, but we weren’t that desperate. The entire day was rainy but not actually raining on us most of the time. It was cool, we did get wet, and I ended the day wearing my cycling tights (quite attractive…), winter cycling gloves, and socks. I’ve carried that stuff the entire trip and only used it a couple of times, but it sure is nice to have it when you’re cold. We are staying in Ludington, as planned. It is kind of a combination industrial and tourist lakeshore town. It is really a small world-as we rode into town, down the main street, we saw the owner of the motel here where we stayed in August, walking one of her Irish wolfhounds. We know one person in town, and there she was. We were actually trying to avoid her. We had decided not to stay with her again because she’s kind of, well… strange. Then we checked into our motel and the lady told us she had just sent a cyclist to another motel as he needed to keep his bike in his room. The more we talked, the more I’m convinced it was Paul, the cyclist we met in Tennessee three weeks ago. Tom doesn’t think so, but I’m sticking to my story. We’ll never know-we passed on the opportunity to look him up at his motel, and he left on the ferry to Wisconsin this morning. The S.S. Badger is huge, 410 feet long and is an old fashioned steamship. 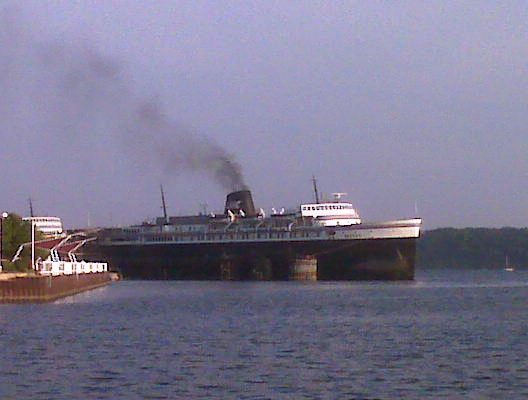 She is billed as the only coal-powered passenger ship still in regular service in the U.S., and she is on the National Register of Historic Places. The trip to Manitowoc, Wisconsin takes four hours. Today is an off day, which is why I can be still writing this at 11:40 in the morning. We could have done without this off day, and I’m sure Tom would have preferred to keep going. I really wanted to savor being so close but still having our arrival to look forward to. Having said that, we have two potentially challenging days ahead of us. We have definitely re-entered the hilly part of Michigan, if yesterday afternoon is any indication. In addition, we will be going “inland” tomorrow, inventing our route as we go and trying to head for Traverse City by way of an overnight stop at Caberfae ski and golf resort. The day home from Traverse City will be short, only about 40 miles. But first we will enjoy this lovely day in Ludington. Before I say anything else, I’d like to address Lindsey’s efforts regarding fundraising for The Motion Initiative in honor of our ride. We are truly honored, both by the concept and by the generous response of so many of you. This ride was not planned as a fundraiser, but if it can be the catalyst for donations to a great cause like The Motion Initiative, we are honored to be part of it. I am not exaggerating when I say that bicycling has transformed and impacted my entire adult life. If the good people at The Motion Initiative can introduce even one young person in Grand Rapids to the freedom and joy of bicycling (while instilling a work ethic and sense of responsibility, a tall order), they will have done a wonderful thing. So we want to thank Lindsey, who wanted to find a way to honor our ride and found the perfect cause. We understand some of you helped her with feedback and ideas, and our niece Kim helped a lot with the process and thank you all for that. We want to thank you so much for donating to TMI. But to ALL of you, thank you for your moral support and your interest in our trip. I know I have said it several times, but it has meant so much to us to hear from you, and to just know that you are there, traveling along with us. Now I’m going to go away and cry a little. I’m back. One last comment on The Motion Initiative. Lindsey chose to tell us about it two days ago because she realized that Holland was the closest we would get to Grand Rapids. We discussed the possibility of altering our trip and riding to Grand Rapids that day to visit TMI. We made the decision not to go, partly because Grand Rapids is a large urban area, just the kind of place we have been so desperately avoiding for five weeks. We will visit them at some point, by car 😦 , and see the work they are doing. We are closing in on the end of this trip of a lifetime. It’s hard to believe. A month ago I felt like it would never end, that we would be out there struggling with routes and traffic (and headwinds) forever. I wondered why I ever thought it was a good idea to do this, but I was determined to see it through. And honestly, there were times that I was scared. Tom was my steadying force at those times, reassuring me, although I think you all know that he has always viewed this trip with cheerful (usually) resignation. Then things started to settle down for us, and the days took on a rhythm. Not coincidentally, that was around the time we left my routes and joined up with the Adventure Cycling Association route. We had a lot of physical challenges, but we had expected those, and they were nothing compared to the discouragement and uncertainties we had faced previously. We began to see geographic progress. State borders fell behind us and the culture began a subtle change. We had some truly wonderful days of riding. The days have passed faster and faster. Suddenly we were meeting Gary to ride with him, and then we were in Thorntown! Indiana was behind us! How did that happen? Being in Michigan, on bicycle, has been so special. We feel like we’re gradually being fed little bits of our favorite, most familiar things – the big lake, of course, and all the little inland lakes. 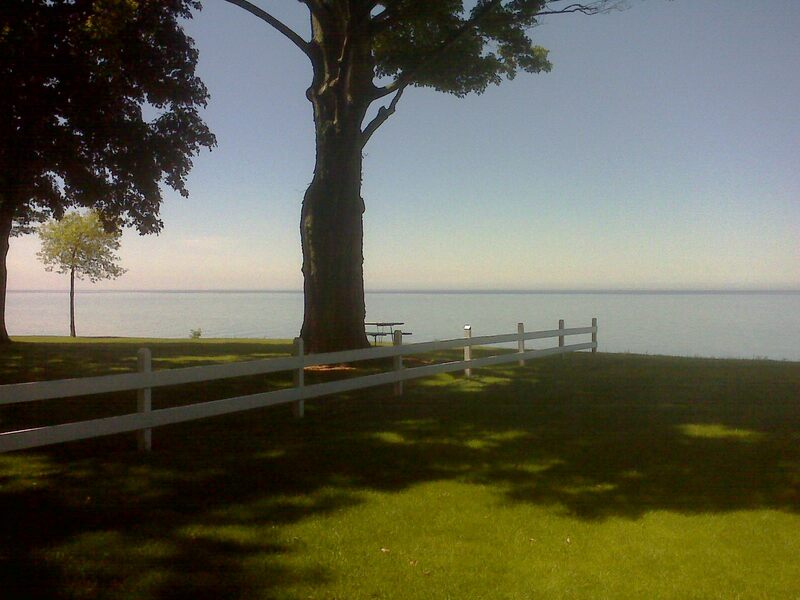 The lakeshore towns all dressed up for summer. The pine woods, that look and smell so different from Georgia. The white birch trees. The salads with dried cherries in them, a staple on most menus up here. The orchards. It is not all better here-Tom has trouble finding Dr. Pepper, or even Mr. Pibb, on menus. (This is a big deal in our family, and when you add it to the fact that there’s no sweet tea, you really have a problem). The drivers in the north are more aggressive-we noticed that beginning in Indiana. And you can say a lot of things about southerners, but there is a friendliness there that we often miss here. Not that there aren’t wonderful people here, and we’ve met many of them. But we frequently encounter an abruptness, particularly from wait staff at restaurants and from small business owners, that you rarely see in the south. It is no different than any summer here, but we have maybe felt it more keenly, being far from either home, and eating out every night. 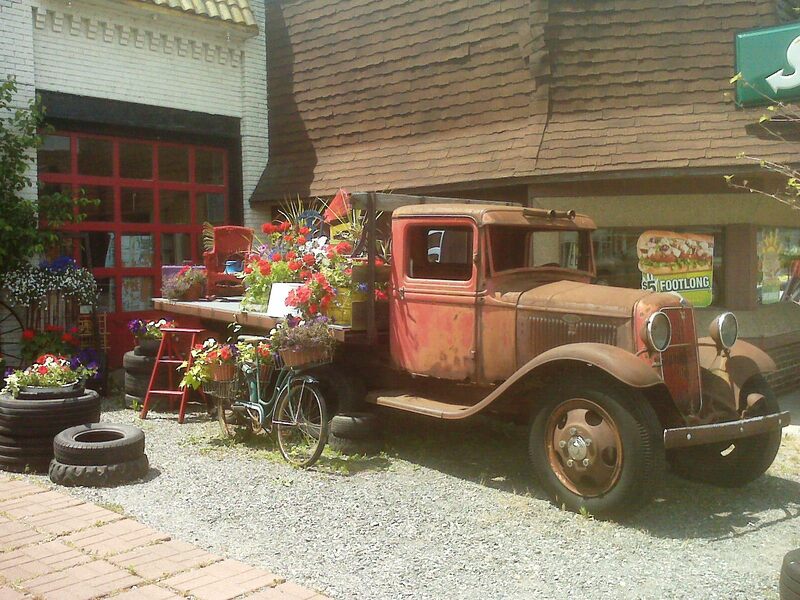 Forgot to say the picture was taken outside Maude’s Garage, an antique store in Ludington. On a different note entirely, things have have been set into motion for our arrival. Tyler has left Peachtree City in the family van, headed for Lindsey and Mike’s house, and our dogs and cat, in Knoxville. The kids were all planning to hike some of the Appalachian Trail tomorrow, and he’s headed to the cabin Monday. We’re hoping he can meet us Monday evening in Traverse City for dinner. So tomorrow we’re headed for Caberfae, we think. Then Traverse City Monday, and home Tuesday! Thank you for sharing you’re beautiful trip with us. It reads like an adventure, travel book. Each day I’ve looked forward to the next installment. I’ll miss your daily up dates. Thanks so much. Love your log. We have a family cottage on Torch across from the “Torch Lake Airport” and are a family of bikers. Very fun to follow your story. I am so pleased that Gerry put your ride on her blog. Your story should inspire some new riders. Thank you for the wonderful photos of The Ferry. I took Gerry’s mom (with Gerry!) and her brother and his wife to Wisconsin in December, 1945 and have many stories of that trip. Her mom and I used to ride in California all year round with the Foothill Cycle Club. We put about 20,000 miles on our trusty Motobecane bikes before hanging them up in the garage.